COLOURS: Grey, black, bay, brown, dun with occasional roan, chestnut, palomino and cream. TYPE: Compact, well balanced riding type with depth, substance and good heart room. Standing on short legs covering a lot of ground. HIND QTRS: Strong and muscular with some length, well developed second thighs, (gaskin) and strong low-set hocks. Connemara ponies should be shown in as natural a state as possible and the following rules should be observed. No Connemara pony may be shown after the age of six months unless it is registered in an Approved Connemara Stud Book. The miminum age for showing foals is five weeks. No entire male may be shown or take part in any competition restricted to Connemara or Registered Mountain and Moorland Ponies after lst January in the year which it attains the age of three years unless it has been registered as a Stallion in the Stud Book of an Approved Society. No female or gelding may be shown or take part in any competition restricted to Connemara or Registered Mountain and Moorland Ponies after the lst January in which it attains the age of four years unless it has been registered as an adult pony in the Stud Book of an Approved Society. 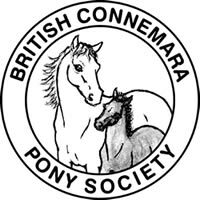 Unless entered in a class specifically for Overheight Connemaras, no Pure Bred Connemara pony exceeding 148 cms in height may be shown or take part in any competition restricted to Connemaras or Registered Mountain and Moorland Ponies within the jurisdiction of the BCPS. Where it is reported to the Society that this may have occurred then the Society may require the animal to be measured or re-measured in accordance with the rules of the Joint Measurement Scheme. The penalty for contravention of the above rules may be cancellation of the registration of the animal concerned. MANES: ponies should be shown unplaited. However, very thick manes may be discreetly thinned but should look as natural as possible. TAILS: should look natural and should not but pulled but may be squared off at the bottom. HEAD: Ears may be trimmed flat (no trimming inside of the ears). Light trimming of long hairs in jawline is permitted. Whiskers should not be trimmed. LEGS: No trimming of feather on legs or trimming into heels. No false hair, artificial colouring or make-up should be used. Ridden ponies ONLY may be clipped in the interest of welfare. Legs should not be clipped. Under no circumstances should foals be clipped. The Society does not object to ponies being freeze branded. This should not be detrimental to animals in the show ring and should be encouraged. Penny would be interested to hear of any important successes with registered Connemara ponies, which could be included in future press releases.